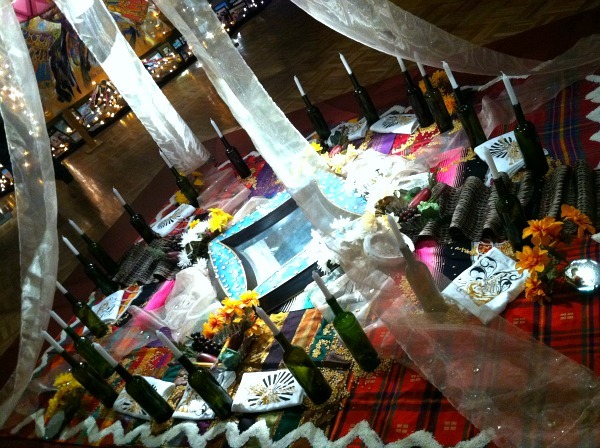 This is a good way to recap the weekend~ through altars and exhibits. 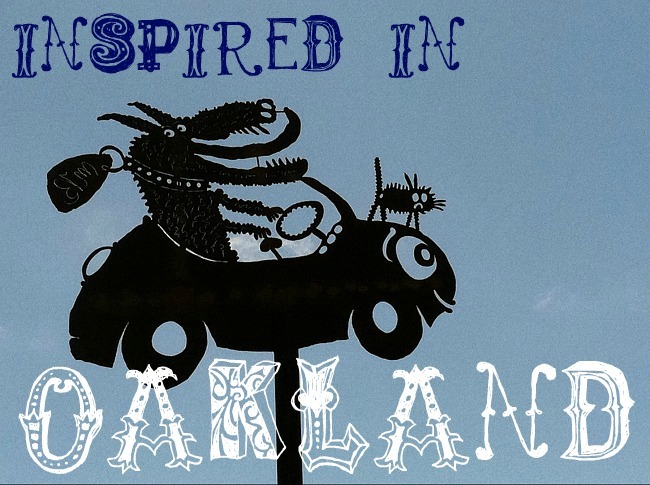 This art is from Oakland muralist-artist Joaquin Alejandro Newman, who had a booth at Noche de Los Muertos on Thurs. It’s the newest addition to our home alter this year. 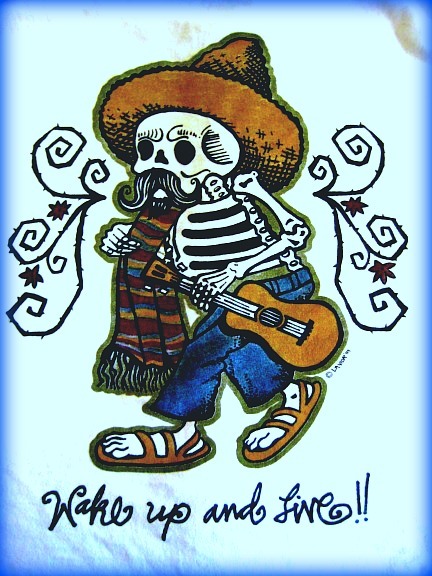 It was the Day of the Dead altar or ofrenda, that first got me hooked on observing Dia de Los Muertos, or the Day of the Dead holidays. 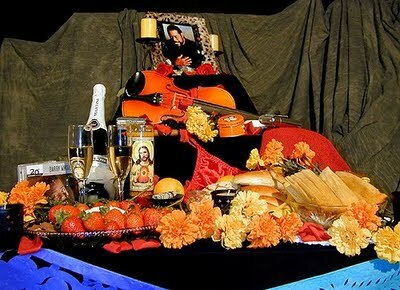 An altar can serve many roles, and perhaps this, the ofrenda, is one thing that makes the holiday confusing or strange to those unfamiliar with the traditions; in Judeo/Christian traditions, alters are for elevating and placing things you worship- gods and saints perhaps. 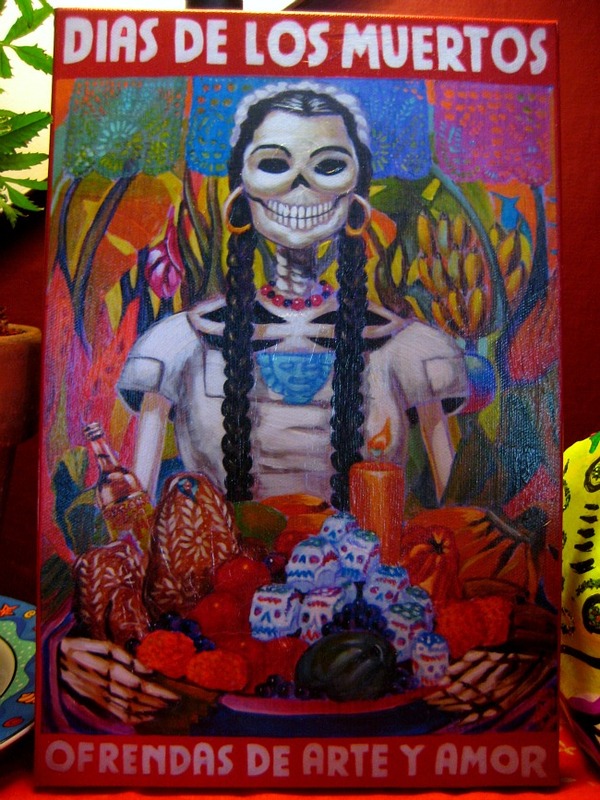 But traditional Day of the Dead alters are both for creating a space for remembrance, and places of welcome for visiting spirits to come enjoy their favorite food, drink, and gifts- all when the ‘veil between the worlds is thin’. I like reading the histories of the first Spanish accounts of the rituals; the Aztecs “mocking death” in dances and rituals led them to think the practices odd and barbaric. But the days were kept, folded into another Catholic holy day- All Souls day. Source with a great key to the purpose of all items placed on an altar. Doing this was complete cartharsis. It gave me the release I needed. Seeing things this way, completely spiritually was different at the time, but it got rid of my guilt in a day. I could finally move on. I added his favorite beer nuts and climbing carabiners so I hope he was happy too. 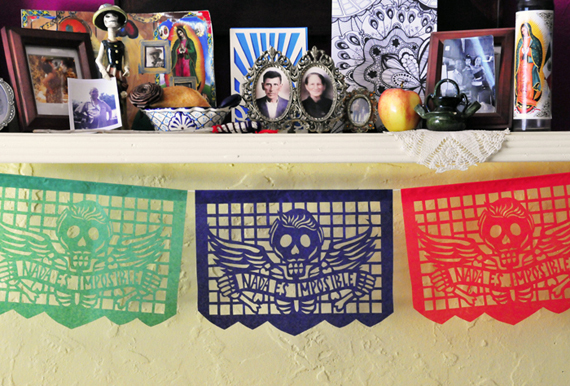 Photo source: (also tutorial for making papel picado). The beauty of building an altar this time of year- is that you can make it whatever you want it to be: a place for memories and remembrance; a space to quietly help heal and provide closure (my example above); a safe place to make light of any fears of or about death. You can make it a hybrid- of old and new- with images of inspiring lives or statues that you believe guide spirits, whatever your beliefs, through obstacles. It can be modest with symbols of the 4 elements: candles (fire), salt (earth), a glass of water, and incense or copal (air). More resources to help you decorate your alter are here. This is the reason I keep little skeletons hidden all over the house; playful reminders of impermanence, and for me to make the most of life, now. 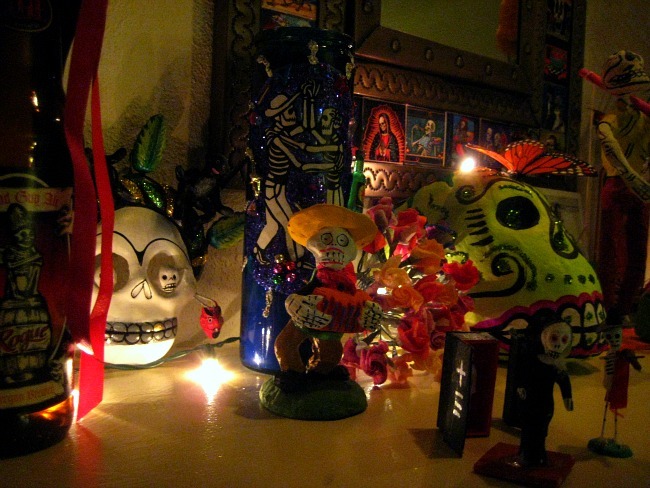 Community altars are the other amazing wonder of Day of the Dead holidays. 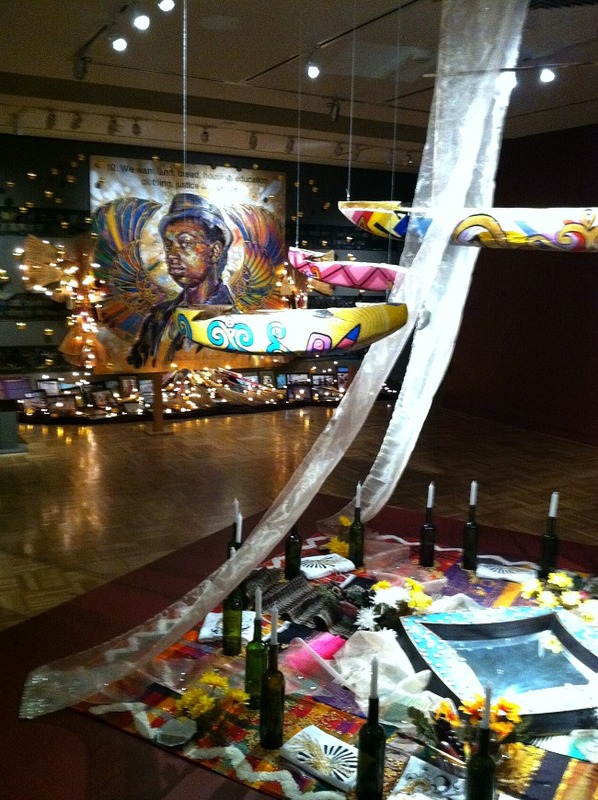 Community ofrendas and art exhibits held in most large cities museums, galleries and art walks this time of year, are powerful showing everything from shrines built by children to large installations by professional artists, sculptors, and painters. And there is nothing like working out your grief as a community, be it local losses, or national- like lives lost in war. I can never forget the alters of September 11th made by artists and children in galleries and warehouses throughout the City of Sacramento 10 years ago. They really did provide solace, as I’m sure community alters in cities across the country did during this time. and one dedicated to Filipino culture, and lore in the after life. Lovely! 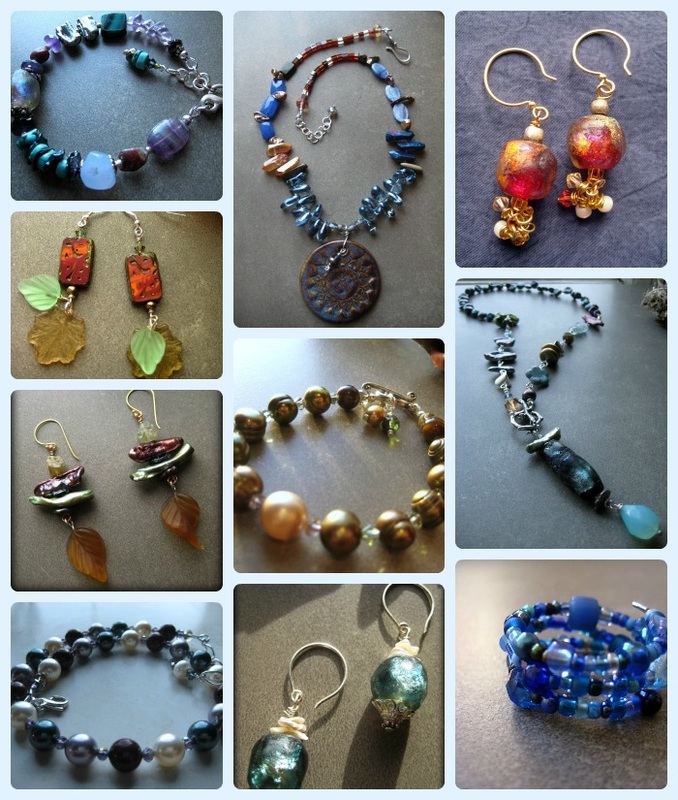 I always enjoy how you visit and publicize local artists. Keep up the great work, and thanks for these wonderful photos.